Touchstorm (www.touchstorm.com) is a technology-enabled services company that builds social media audiences for the world's largest brands. Growing company is already serving Gillette, Venus, Pantene, Head & Shoulders, and Discovery Channel out of Mumbai, running YouTube channels, hiring local influencers, and making optimized content. 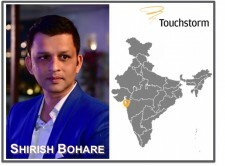 MUMBAI, India, November 15, 2018	(Newswire.com) - Global tech-enabled services company Touchstorm, LLC, addressed a growing need from India-based clients and announced an expansion with a new office located at Marol Naka in Mumbai. In addition to the new office space opened over the summer, the Mumbai-based team is headed by digital marketing expert, Shirish Bohare, formerly Digital Director at FCB Interface (Mumbai). "We were already very well established in India, because not only do we have numerous high profile clients across the country, but our extensive engineering operation has been based in Pune for more than four years," said Touchstorm CEO, Alison Provost. "And, we're so pleased to have Shirish in this newly created role to lead our local channel management, influencer marketing, and video production teams across this flourishing region," Provost added. "About two years ago, Jio gave people smartphones, and as a result, YouTube exploded in India. Our data shows that India is now YouTube's 3rd biggest market," Provost further explained. "We have been helping global brands attract organic audiences on YouTube, and buy advertising there for 11 years. All of a sudden, India became our second biggest market after the United States." 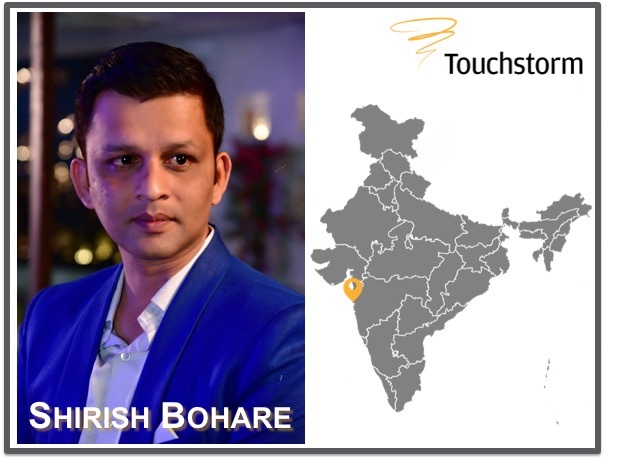 Bohare offered, "My time at FCB was quite important to me, but when I discovered Touchstorm, I knew I wanted to run their India operation. YouTube is where the Indian consumer is now. Also, Touchstorm is the only company in the world with this specialised expertise." Bohare continued with, "At Touchstorm, we use our massive VideoAmigo database to discover what content our client's audience is searching for, we also recruit, hire and manage local influencer talent, and produce and optimize video content." Locally, Touchstorm works in English, Hindi, and all major Indian regional languages. Touchstorm (www.touchstorm.com) is a data-focused tech-enabled services company that builds YouTube and Instagram audiences for global brands. By categorizing videos and channels into precise marketing Topics, Touchstorm turned social media into research tools, and a portion of that data is free to the public at VideoAmigo. VideoAmigo (www.videoamigo.com) is the world’s largest platform for managing YouTube channels, studying YouTube lists, finding and connecting with YouTube influencers, and buying YouTube advertising. VideoAmigo gets its data from the Touchstorm Video Index, the largest YouTube database outside of YouTube, with more than 130 million channels and 2 billion videos. The VideoAmigo tools focus on helping creators and brands Rise Above Your Rivals with robust marketing analysis that reveals what's never been known or possible before. Touchstorm, LLC, and VideoAmigo are owned by Diginary Holdings, headquartered in New York and Richmond (in the United States), with global employees serving clients around the world. Diginary Holdings is self-funded and women-owned. Touchstorm is certified as a women's business enterprise by the Women's Business Enterprise National Council (WBENC), the nation's largest third-party certifier of the businesses owned and operated by women in the United States. Company clients include Alienware by Dell, COVERGIRL, Gillette, Head & Shoulders, Kenmore Appliances, Pampers, Schneider Electric, T-Mobile by Deutsche Telekom, Veer by Discovery, Venus, YouTube, and more. Sign up for email updates from Touchstorm, LLC.